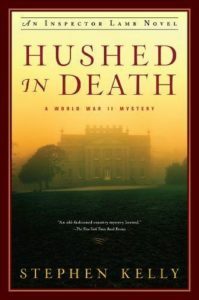 Hushed in Death Archives - Joelle Delbourgo Associates, Inc. In the spring of 1942, with the war in Europe raging, a gruesome murder shocks the rural community of Marbury, where a once-grand estate called Elton House has been transformed into a hospital for “shell-shocked” officers sent back from the front lines. When Detective Chief Inspector Lamb arrives to solve the case, he quickly learns that the victim, Elton House’s gardener Joseph Lee, had plenty of enemies in Marbury—and so he and his team have plenty of suspects. Along with his team of investigators, which includes his daughter Vera, Lamb begins to untangle the threads of rivalry and deceit that lie beneath the surface of the seemingly-peaceful countryside village. It soon becomes clear that Lee’s mysterious past is intertwined with the history of Elton House itself, which fell into disrepair a generation earlier after a shockingly similar murder, and the mystery deepens further when Lamb discovers that one of the prime suspects has seemingly committed suicide. As Lamb pieces together the connections between the crimes of the present and those of the past, he must dive into the darkest, most secret corners of Elton House to discover who is committing murder, and why. I’ve always loved reading good mystery novels, especially those from the English masters — Conan Doyle, Dame Agatha, Colin Dexter, Peter Robinson and others. I’m also a huge fan of the Norwegian crime novelist, Karin Fossum. Before turning to writing fiction with a vengeance, though, I was, for nearly thirty years, a newspaper reporter, editor and columnist. My work has appeared in the Baltimore Sun, The Washington Post, Baltimore Magazine, The Columbia Flier and Howard County Times. I have a Master’s from the Johns Hopkins University Writing Seminars and have taught writing and journalism at Hopkins, Towson University, in Baltimore, and Sweet Briar College, in Virginia. I live in Columbia, Maryland, with my wife, Cindy, and our daughters, Anna and Lauren.